A new year has arrived. You have started to list the home improvement projects you want to accomplish in 2016. Wouldn’t you love to cross off cleaning your home’s gutters from your to-do list? Instead of climbing up on a ladder to clean out all the gunk from winter and then removing all the leaves in the fall, why not do what thousands of homeowners have done and upgrade your home with K-Guard gutters in 2016? K-Guard gutters are a unique and complete covered gutter system that not only prevent leaves and most debris from entering, but also whisk water away more efficiently from your roof and eaves. One of the biggest advantages of this system is the 5-inch wide trench style gutters that, when combined with oversized downspouts, remove water much more quickly than traditional gutters, along with downspouts that are 3/4-inch wider than those manufactured by the competition. This system has a host of other features that make it the ultimate low maintenance gutter system that will last for many years. Made of heavy-duty aluminum, its chassis won’t rust or deteriorate. The system is also inherently strong thanks to its internal bracket system, making it able to withstand virtually any weather. The K-Guard system is also beautiful and will complement your home perfectly. It has a baked on enamel finish that will stand up to years of wear and tear and continue to look good, along with curved corners that will complement your home. Another big advantage of the K-Guard system is how well these gutters protect your home from water damage. 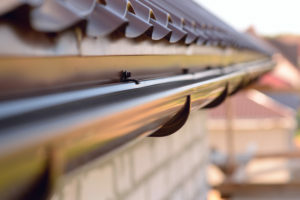 When traditional gutters clog due to leaves and other debris, water can overflow, flowing down the sides of your home and ultimately leading to damage to the foundation and other structures. K-Guard eliminates this potential by whisking away rainwater and snowmelt in an efficient manner. In addition to coming in many different colors to match the exterior of your home, K-Guard also attaches to fascia board and rafter tails to increase strength. It will not interfere with your roof or roof lines and presents a smooth appearance that mimics crown molding.